Mighton are very pleased to announce that we are the headline sponsors of the next charity cycling event to be run by G M Fundraising in aid of Hope House Children’s Hospices. This is a 2,616 mile ride along the iconic Route 66, from Chicago to Santa Monica. (or as much of it that can be cycled) 15 people from the window, glass and construction industry and a support team of 6. They will be facing temperatures in excess of 40 degrees and climbing over 77,000 feet and a few 100 plus mile days in September 2013. 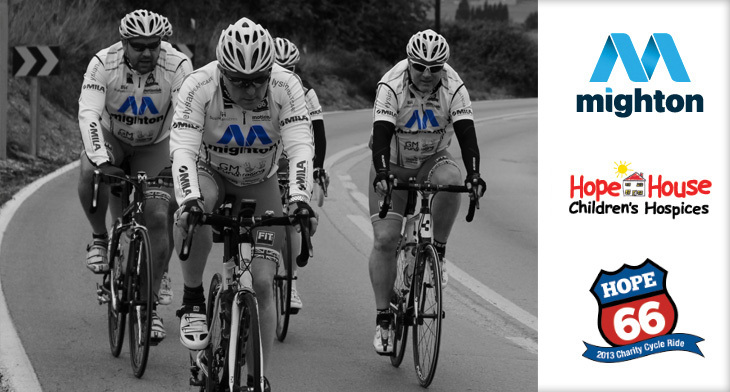 Their aim is to raise over £75,000 for the children on this ride, so anything you can do will be much appreciated.